This past May long weekend, the Dude, his Dad and I headed off to Karters' Korner in Fallowfield to do some karting and play some mini-golf. When I mentioned our outing on Twitter, I was asked by @kidsincapital to blog about it for their fantastic site. How could I say no? 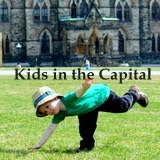 You can read about our karting/golfing adventures, Go-Karting in the Capital, on the Kids in the Capital website.